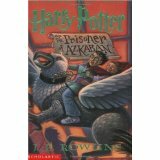 Book and Movie review for Harry Potter #3. (You can find review of #1 here and #2 here.) I can’t say this is very high on my favorites. This one was more of a bridge or sideline plot in the Harry Potter saga…at least it seemed that way to me. I liked it well enough, and it does move the story along by giving a few more pieces of the puzzle regarding what happened to Harry’s parents…but it wasn’t my favorite. I’m still going to give the book a 5 hand rating…because I can still pick it up like the others and reread whenever I want. I loved how they did the dementors! What was slightly disappointing about the movie is how dark it seems to be. I understand the subject matter is a bit dark…but when I have to adjust my tv settings just to see what is going on, it’s too dark. I’m also disappointed by the fact that Harry’s patronus only goes corporeal that once. I think what saved the movie for 5 hand status for me was the character development. My all time favorite part was when Hermione punched Malfoy…perfect!